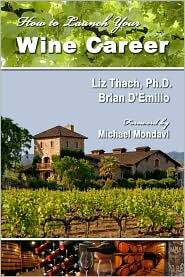 How to Launch Your Wine Career profiles several different careers within the wine industry from working directly with the grapes or wine (vineyard manager, Winemaker) to running the business side of things (Marketing & Sales) to careers one level removed (Wine Writing & Education). Each chapter is a trove of interesting information starting with what the job actually entails; thus ruining those overly romantic ideals we’ve all had about getting paid to sip wine all day. It then flows into what skills and degrees are required, what the career ladder looks like, and then important things to consider as you contemplate joining the industry. Tips on getting started, acquiring the right skills and even meeting the right people give the book its competitive advantage. We found the sections on helpful books, conferences, and websites to be very helpful in putting theory into practice. At the end of each chapter are interesting vignettes and advice from people who actually do have the job you want. How to Launch Your Wine Career is quite realistic in its presentation of each role, which may burst a few bubbles. For most of us the switch to the wine industry wouldn’t be an easy one as most positions require advanced degrees and experience in other wineries that aren’t easy to come by. However, for those who truly have the passion and the means to make a career change, this wine book is an imperative reference point.